When I came across these heart cupcake liners at my local craft store, I had to get them. Not to use them in the kitchen but in my craft room. 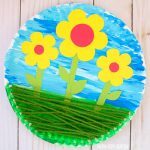 I’ve seen many cupcake liner flower crafts on Pinterest before and I was ready to try one myself. These heart cupcake liner flowers are such a fun idea for Valentine’s Day or Mother’s Day. Make them on a spring day or any other day. 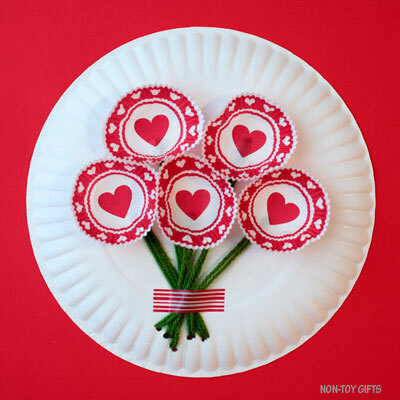 If you can’t find heart cupcake liners, you can use any color or pattern cupcake liners. 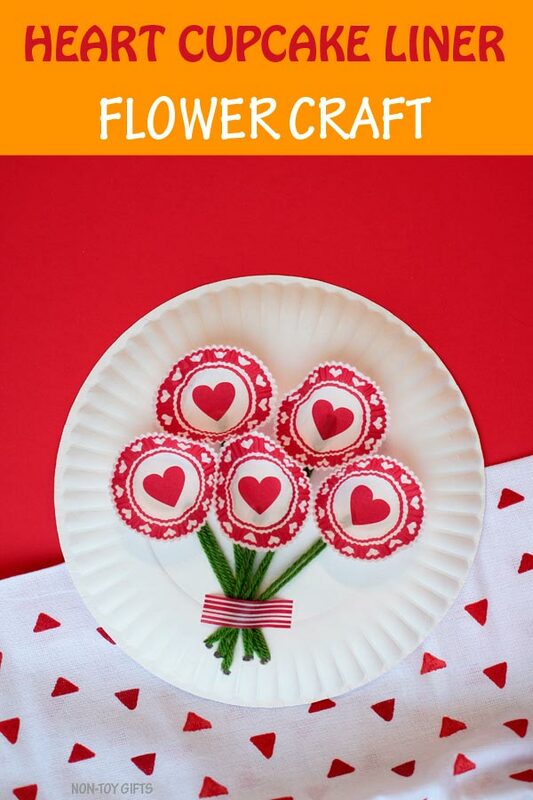 Go for red or pink if making the flowers for Valentine’s Day. 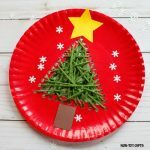 Because we love paper plate crafts as well as yarn crafts, we incorporates both a paper plate and yarn into our flower craft. We used the yarn to make the flower stems – an easy sewing project for preschoolers. 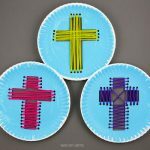 Because paper plates are sturdy they are great to sew on. Use a plastic yarn needle for an easy sewing experience. 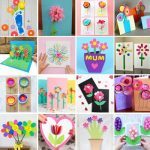 Once you are done making these cute flowers and want to keep on going, here are 50+ more flower craft ideas. Our favorite flowers are the handprint flower bouquets . We made them for my kindergartner’s teacher and aide teacher as a classroom gift but they can be made for any occasion. Start by placing 5 small cupcake liners on the paper plate. Arrange them into a bouquet and trace their stems with a pencil. Use the pencil to poke little holes at the two ends of each flower stem. Cut a big strand of green yarn, thread it through the plastic yarn needle and tie one end to the needle. Secure the other end of the yarn to the back of the paper plate with tape. You can now start threading the yarn through the holes in the paper plate. Go stem by stem. Thread once, twice or several times through each stem. Once you are done, cut the yarn from the needle and secure the end to the back of the paper plate with tape. Turn the cupcake liners inside out so that the hearts are on the inside of the cups. 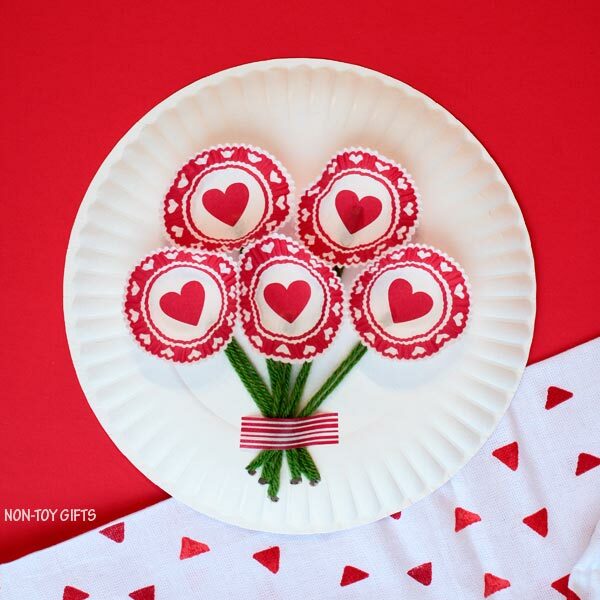 With Valentine’s Day just around the corner it’s easy to find heart cupcake liners at craft or grocery stores. Otherwise, you can also get these heart cupcake liners online. They are not exactly like the ones that we used but they do have a nice heart pattern. Because they are regular size liners, you will need to use only three of them. 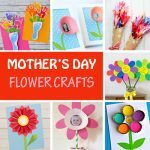 Glue one cupcake liner at the end of each flower stem. 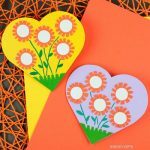 Cut a piece of washi tape and place over the flower stems, as if it holds them all together. 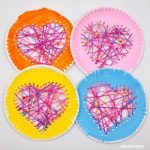 Combine cupcake liners, a paper plate and yarn to make a bouquet of beautiful flowers. 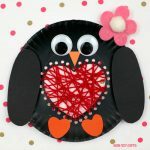 Perfect as a spring craft, for Valentine's Day or Mother's Day. Turn the cupcake liners inside out so that the hearts are on the inside of the cups.